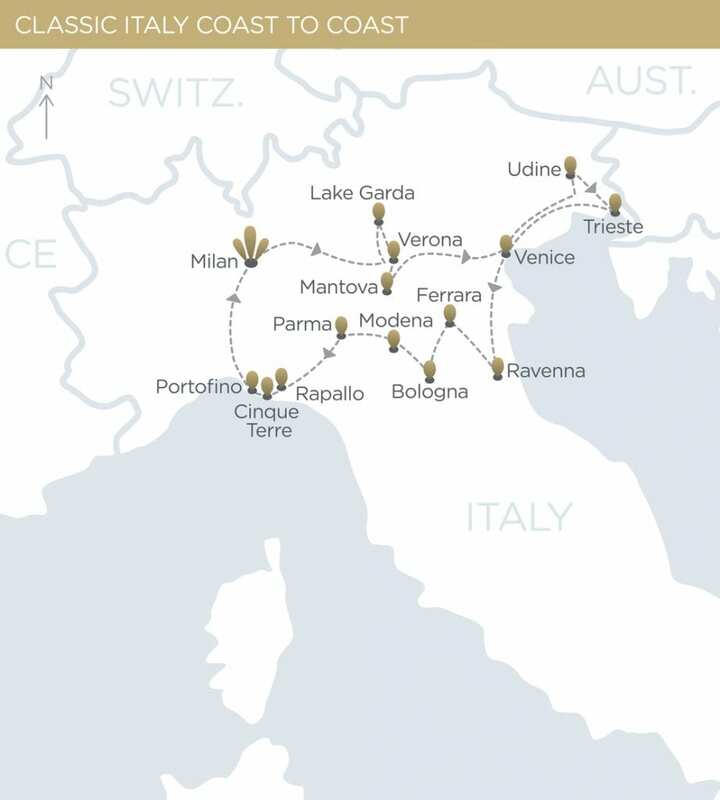 You are invited to leisurely explore the rich and fertile northern regions of Italy on this 22-day adventure. you will experience the best of the lush north renowned for its stunning countryside. 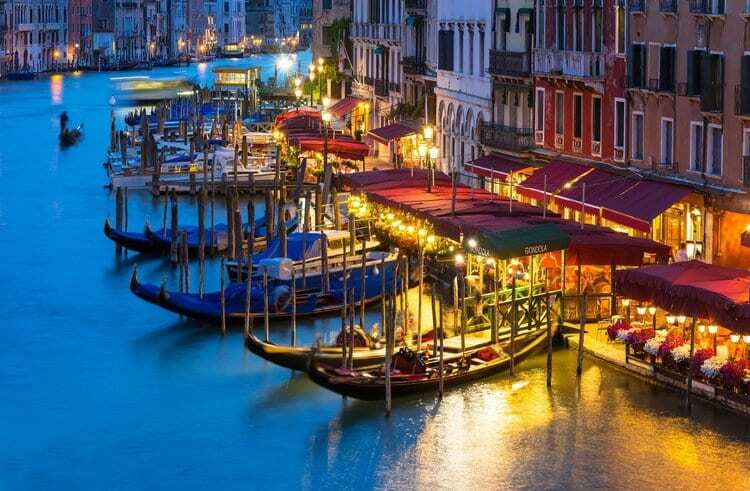 Naturally, a visit to Venice, ‘Jewel of the Adriatic’ is essential on this classic tour. Our travels continue to the area where the gastronomy of Italy really shines. Come to think of it, so many famous export products come from just this region alone, balsamic vinegar from Modena, prosciutto ham from Parma and of course the delicious parmesan cheese. Travelling from coast to coast, the tour leisurely winds up in Liguria. With temperatures still mild, late summer is an ideal time for touring this part of Italy. Join us in the country of ‘La Dolce Vita’ and experience Italy at its finest. * Cruise along the canals of Venice, the most romantic city in the world! you will have access to your room all day until check-out in the early evening. Accompanied by a local guide, we start our adventure with a walking tour of Verona. Located in the Veneto region, one of Italy’s most beautiful cities and known as ‘Little Rome’, Verona has been a Roman colony since the 1st century BC and is famous for its pink marble ‘Arena’. This third largest Roman amphitheatre now acts as the Opera House attracting acts from all over the world. Today we head for Lake Garda and drive along the lake to Limone to enjoy some free time after which we will board a boat to Malcesine to have lunch. Lake Garda is the biggest pre-alpine lake in Italy. flavours and tastes that combined with its history distinguish the city from the rest of Italy. Lets cross the border and set out to enjoy a day trip to nearby Slovenia. First we drive to Ljubljana where we set out on a walking tour with a local guide followed by free time for lunch and shopping. Today we drive towards the little town of Castel San Pietro in Terme. ‘Porticoes’ after which we will continue the day with a drive to Dozza, a small medieval hamlet known for its ‘Festival of the painted wall’ where art blends with street furniture as it covers the walls of houses, streets and squares making every corner brighter and offering lovely views. n the morning we enjoy a guided walking tour of Bologna, a walled city that reached its peak in the 12th century. Wealth brought a building boom and every well-to-do family left its mark by building a tower, there were 180 of them in all of which 15 still stand. Renowned for its rich gastronomy, Bologna is lively and vibrant, the 11th c. university, arched porticoes line the streets and squares of its historic centre. mosaics in the world and in Ravenna some of the best-preserved examples of Byzantine art are right in its heart, many World Heritage listed. We transfer back to the coast for our stay in the region of Liguria. afternoon, we continue with a visit to a local farm to study and taste the famous prosciutto crudo ham. The final leg of our journey is designed for sitting back and relaxing and taking in the picturesque coastline. After breakfast we board a boat headed for Portofino. Best known for its pastel-coloured houses around the port, this exclusive hub has been the base of many poets and writers and is now home to the rich, famous and powerful. of Italy really is a picture postcard. We will visit some of the better known villages famous for their four storey houses, narrow lanes and good views. Enjoy a relaxing breakfast as today is at your leisure. With its Roman origins, the town of Rapallo boasts a bridge supposedly used by Hannibal during the Carthaginian invasion of Italy in 218 BC. All good things come to an end and after breakfast and hotel checkout, we head for Milan Malpensa International Airport for airline check-in.